Dredd is currently as good as it's ever been. I am also very pleased that the Macneil droid is giving Dredd chunkier boots. That single page splash nearly made me splash the single page! And another thing - this isn't Dredd's house, it's Justice Department's house. It's a house of justice. The Dredd remained underwhelming for me I'm afraid. Also, Dredd didn't know that Smiley had allowed the apocalypse war to happen until he saw the files. So why was he planning to kill Smiley via Conveniant Gerhart in the first place? Wouldn't it be better to, y'know, arrest him instead? Like a Judge would? Because Dredd has dealt with enough wiley foxes to know they won’t be taken easily. Because he dosent under-estimate Smiley And knows there is a long game and many solders if not exactly what. Next thing you know you’ll be doubting the existence of Kleggs and pondering just how a gun could laser out a whole intersection at the rate of 9.8ms (increasing). Oh and the whole ‘rob Williams horse’ thing... bit off frankly lads, Henry Flint said he wanted to draw Dredd on horseback so Williams obliged. So slag it off as Henry Flint’s Horse. For me it was a brilliant needle drop moment and part of an amazing section (the whole save the chief judge / dirty frank interaction). But I guess it’s not for some. Nor it seems the frankly franktastic Small House. To those I’d ask - what exactly is? Firstly, I'm not having a pop at Henry Flint - his art is untouchable. Secondly, I don't agree that Dredd would set up such a ropey plan without already having all the evidence he needs (which he clearly didn't), especially when he thinks Hershey is involved (which he clearly did). 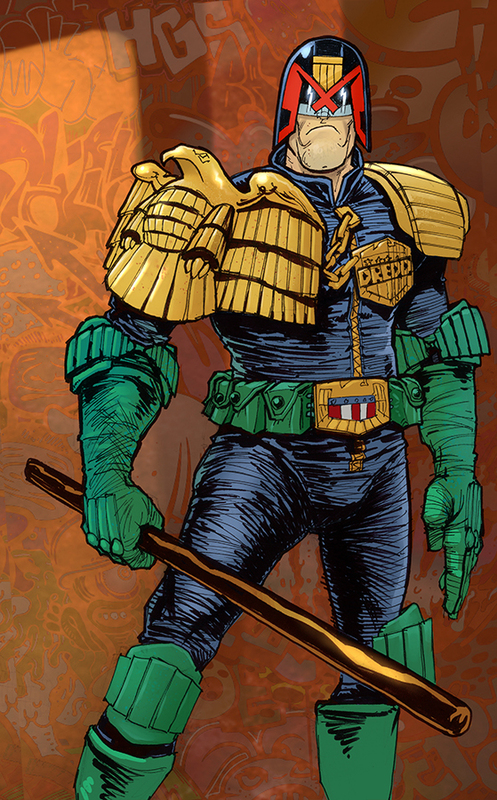 Thirdly, no matter how cool Dredd on horseback looks, it's still a daft idea. Accepting all this just because Rob Williams wrote it? Apologies if I've misread your post. Rita, Sue, and Gestapo Bob too. Prog / Re: Prog 2104 - The Watchers in the Walls! Addendum: I would still prefer to have Henry Flint coloured by Henry Flint, as it's awesome, but Chris Blythe in this current style is a very close second choice! I'm guessing it's a conscious effort of the Blythe droid's to try and mix elements of Flint's colouring style with his own. As you say, he's right to do so. It looks great! The texture of Flint's colouring style, without the more out-there colour contrasts. Should add: Henry Flint is on fire! And I'm adoring Chris Blythe's Flint-esque colouring. Brilliant stuff! Dredd just isn't doing it for me. I'm getting fed up with different writers seemingly having their own Dredd continuity. Enceladus is obviously a big deal in Williams' Dredd-verse but is never mentioned in any other writer's Dredd strips. Likewise, Dirty Frank and Sensitive Klegg seem to be Rob Williams exclusive characters (to be honest, I think both are joke characters who have worn thin). Fully agree that Dirty Frank and Sensitive Klegg are a bit over-used, one-note joke characters. Hopefully there's a Dirty Frank revelation coming up that explains just how he's managed to continue being a Judge for all this time, and not get pensioned off to the cursed earth. I'm also not really getting the plot: Secret Judge who lives in the walls that Dredd and Hershey already know about, is using invisible Ninja Judges that Dredd and Hershey already know about, to make assassinations that Dredd knows about and is investigating (that Hershey doesn't know about). Is that right? And if so, why hasn't anyone just arrested Smiley and taken him in for interrogation? The beauty of this is that we've already had it, and it was by John and Carlos.